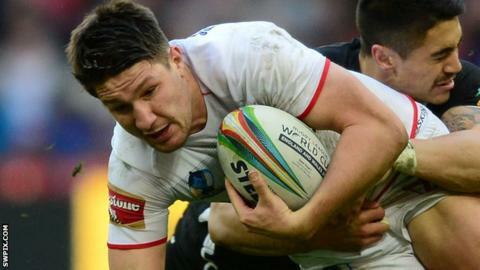 Gareth Widdop is what the Australians call a 'gun' of a player - a champion, a star - and England need him to fire if they are to achieve success in this autumn's Four Nations series, which starts on Saturday. The 25-year-old, who left West Yorkshire's Halifax for Melbourne and the state of Victoria at the age of 16, has become one of the most devastating playmakers in the Australian National Rugby League. When England kick off the series against Samoa in the first of a double header that also sees world champions Australia play New Zealand, Widdop hopes to turn his talents against the southern hemisphere's finest. As apprenticeships go, Widdop enjoyed one of the best. He developed alongside Australia stars such as Cooper Cronk, Cameron Smith and Billy Slater at Melbourne Storm where he won an NRL premiership, and is now the brains behind the attack at Sydney-based St George-Illawarra. However, at international level he has had to wait for his chance to shine. At one stage, the former Halifax scholar pondered a future with his adopted nation, before an England debut in June 2010 - when he scored a try against France from full-back - saw him finally commit to the country of his birth. Only four of his 11 caps have been starts, but last year's World Cup marked a breakthrough, when he was given the nod for the semi-final against New Zealand ahead of Rangi Chase and won plaudits for a fine display. England coach Steve McNamara has named Widdop in his Four Nations squad on the back of an outstanding 2014 season in which he came fourth in the prestigious Dally M player of the year awards, which is a vote to rank the best performing players in the NRL. "The last few years I've been on the tours and probably been disappointed I haven't managed to start all the games," Widdop told BBC Sport. "I played a number of games coming off the bench. It was great to play in that semi-final at the World Cup and hopefully I will get that opportunity again to start the game and make the most of it. "Pulling on the England jersey is certainly a proud moment and it doesn't come round too often so you have to make the most of it." One of the reasons why the talented stand-off has remained on the fringes was the loyalty shown to former captain Kevin Sinfield, who often played at half-back for his country before retiring from international duty in September. "I think it was a bit of a shock to everyone at the time and I'm sure he's got his reasons for it," Widdop said. "He's been a great leader for England the past few years and to lose someone with his experience and composure is obviously disappointing but people move on. "I'm sure there are other players in that team who will step up." With Sinfield now gone, the door has opened for the Dragons playmaker, who will operate alongside Wigan Warriors scrum-half Matty Smith for England, to stake a regular place, just as he done in the NRL. What makes him such a novelty as an Australia-based player is his position - a genuinely creative pivot. Most of the imports from the 'Old Dart' have been big, battering-ram forwards, from Mal Reilly and Brian Lockwood through to James Graham and Sam Burgess - players built to rumble - but Widdop is a craftsman, a huge talent with the ball in his hands. He perhaps shares more in common with rugby league 'immortal' Bob Fulton, who arrived in Australia from Warrington in the 1950s and became a star for the Kangaroos and Manly at stand-off or centre. Team-mates are quick to praise him - Benji Marshall spoke of his telepathic understanding of their combinations and Trent Merrin hailed a composure and coolness under pressure - while former players such as Matty Johns, himself a formidable half-back, believes it is "an appreciation for the subtleties of football" that makes Widdop such a key player. It is fortunate for McNamara, who is also based in the NRL as assistant with Sydney Roosters, that such a rich seam of English talent is currently lighting up the league. Graham, a powerful prop at Canterbury-Bankstown, South Sydney Rabbitohs' twin forwards Tom and George Burgess, New Zealand Warriors full-back Sam Tomkins and Widdop's club team-mate Mike Cooper have all helped to enhance the reputation of 'Pommie' footballers in the southern hemisphere. "I think the more English players that come down there, the more respect we gain," Widdop added. "It's great to see players like the Burgess brothers and Graham playing in this competition, I think we're gaining a lot more respect and last year [in the NRL] showed. "We're showing we are a good team and English players can succeed." With the majority of the Aussie-based England players dotted around Sydney, there has been a chance for the exiles to keep in touch and socialise. "With the season being busy and playing at different venues, it is difficult but we've caught up once or twice, and the England boys have been out for dinner which is great for keeping in contact," Widdop said. "Steve, being over here this year, has been able to keep a closer eye on the lads out here - over the past few years he's been in England and hasn't been able to keep too close an eye so it's been good." There is optimism about the England side going into the Four Nations but the last time a northern hemisphere team won a series down under was in 1990, when Great Britain beat New Zealand 2-1. To emphasise the difficulty of the task ahead, the last single match victory came in 2006 when Brian Noble's Lions defeated the Kangaroos in Sydney - when Widdop was still a college student. "I think it's always more difficult when England travel over here to play in Australia or New Zealand but having a number of English boys playing in the NRL will definitely help," Widdop added. "We play against the Australians and Kiwis week in, week out and we know a lot of their players so hopefully it should be a good competition."